This gallery contains 192 photos. 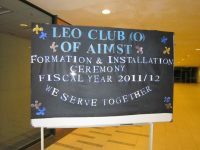 AIMST University Faculty of Medicine Felicitation Ceremony 2011 Date: 7th October 2011. Venue: LT1, Faculty of Medicine. Photographer: Herrick Q’more Congratulations to all the medical scholars. Below are the photo gallery of the felicitation event. This gallery contains 251 photos. AIMST University HPV (Human papillomavirus) Symposium 2011 Date: 27th May 2011 (Friday) Venue: AIMST University Great Hall A Medical Symposium organized by Aimst Medical Faculty for create awareness on HPV infection in Malaysia. This gallery contains 198 photos.